NO PURCHASE NECESSARY. A PURCHASE OR PAYMENT OF ANY KIND WILL NOT INCREASE YOUR CHANCES OF WINNING. SUBJECT TO APPLICABLE FEDERAL, STATE, LOCAL AND MUNICIPAL LAWS AND REGULATIONS. VOID WHERE PROHIBITED. WINNER MUST HAVE A GOVERNMENT ISSUED PHOTO ID. 1. On-Line Entry. Enter by visiting Sponsor’s website (majesticgardenhotel.com), completing all of the required information (name and email address), and following all posted instructions. Complete the entry form and any other required fields and then submit your entry by clicking on the “SUBMIT” button. Entries limited to only one (1) entry per person. Your computer must accept cookies, or any successor or similar technology, which may be used for the purpose of entry tracking. Ad blocking software on your computer needs to be disabled so that it doesn’t interfere with processing your entry. Multiple entrants are not permitted to share the same email address. The authorized account holder of the e-mail address submitted at time of entry will be considered the entrant. An “authorized account holder” shall mean the natural person assigned to such e-mail account by the Internet access provider, online service provider, or other organization responsible for assigning e-mail addresses for the domain associated with such e-mail account. A potential winner may be requested to provide proof that he or she is the authorized account holder of the e-mail address associated with a winning entry. Sponsor will not be responsible for incomplete, lost, late, misdirected or illegible entries. All entries become property of Sponsor and none will be returned. By entering, you agree to the terms of these Official Rules and to receive e-mails from Sponsor or those directed by Sponsor. You can opt-out of the receipt of such e-mails by following the directions on the Sponsor’s website or in any email received from Sponsor. 2. Eligibility. Anaheim Star Wars Quest Giveaway (Dates February 7, 2019/May 7, 2019) (the “Promotion”) is open only to legal United States residents who are physically located and residing in the fifty (50) United States and Washington, D.C.
Entrants must be at least twenty-one (21) years old at the time of entry. Employees of Anaheim Majestic Garden Hotel and their parent, subsidiary, and affiliate companies, suppliers as well as the immediate family (spouse, parents, siblings and children) and household members of each such employee are not eligible. Subject to all applicable federal, state and local laws and regulations. Void where prohibited. Participation constitutes entrant’s full and unconditional agreement to these Official Rules and Main Sponsor’s and Administrator’s decisions, which are final and binding in all matters related to the Promotion. 3. Winner Selection. A total of one (1) Grand Prize Winner will be selected after 12:00 p.m. (P.T.) May 10, 2019. Administrator’s computer is the official time keeping device for this Promotion. 4. Prizes and Odds. Odds of winning depend on the number of eligible entries received. 5. Grand Prize. 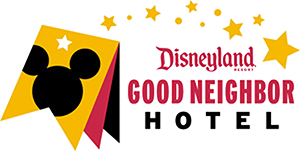 The Grand Prize Winner will receive Four (4) 2-day Park Hopper® Tickets for Disneyland® Park and Disney California Adventure® Park, Premium room for 3 nights, Complimentary Garden Court Bistro buffet breakfast for 4 each morning, $200 dinner credit at the NEW Hanagi Japanese Restaurant (scheduled to open May 2019), Star Wars goody basket, and Dream Machine Daily Shuttle to/from Disneyland® Park**. GRAND PRIZE REDEMPTION MUST BE COMPLETED BY MAY 22, 2020. Excludes the months of July & August, 2019 and Holiday periods. Winner’s travel companions (each a “Guest” or collectively “Guests”) must be at least eighteen years of age and the age of majority in his/her state/province or jurisdiction of primary residence unless the winner is such Guest’s parent or legal guardian. Each Guest (or if such Guest is a minor, the parent or legal guardian) will be required to verify address and to execute a Travel Companion Release, as directed by the Administrator. Failure to return the executed Travel Companion Release within the specified time period may result in forfeiture of the Trip for the Guest. No refund or compensation will be made in the event of the cancellation. The Grand Prize may not be sold, traded, transferred, rescheduled to dates not within the fulfillment period set for the above or refunded, and are not redeemable for cash. All costs and expenses not specifically included herein are solely the Grand Prize winner’s responsibility as are all federal, state and local taxes. Sponsor bears no responsibility if any event, element or detail of the Grand Prize is canceled, postponed or becomes unavailable for any reason. Should any event, element or detail of the Grand Prize become unavailable, the Sponsor shall have no obligation to the Grand Prize winner aside from providing the remaining portion of the Grand Prize, minus any unavailable event, element or detail. The Grand Prize winner and his/her guests shall be subject to all terms and conditions. In the event the Grand Prize winner and/or guests is denied entry into any of the listed theme parks due to inappropriate behavior, Sponsor is not responsible and no further compensation or award will be provided. 6. Total ARV. The approximate retail value (ARV) of all prizes in this Contest is $2,100*. 7. Prize Conditions. Sponsor, Administrator and their respective parent, related, affiliated, and subsidiary companies and their respective officers, directors, agents, employees and assigns, shall be released and discharged from any and all legal claims, losses, injuries, demands, damages, actions, and/or causes of actions that arise out of and/or are in any way related to a prize and/or the receipt, use and/or enjoyment of a prize and/or the Contest. All benefits and payments are personal to each winner and are not redeemable for cash and are neither assignable nor transferable. Each winner is responsible for paying all taxes, if applicable. The award of a prize is subject to applicable withholding requirements. The Grand Prize winner will receive an IRS Form 1099 reflecting the actual final retail value of his/her prize, if applicable. Any portion of a prize not accepted or used by a winner will be forfeited, and Sponsor shall not be responsible for any inability of winner to accept or use any portion of the prize for any reason. No substitution or transfer of a prize is allowed except with Sponsor’s permission or where required by law. If for any reason a prize becomes unavailable, Sponsor may award a substitute prize of equal or greater value. Award of a prize is subject to verification of eligibility and compliance with these Rules. Allow approximately 4 weeks after award of a Finalist Prize for prize availability. 8. Grand Prize. The potential Grand Prize winner will be notified by e-mail at the e-mail address provided during Finalist verification on or about May 10, 2019. The potential Grand Prize winner must respond to such notification within 48 hours from the date notification is sent. If acceptance is not received within 48 hours, the prize will be forfeited and a new potential winner will be selected. 9. General Requirements. At the sole discretion of the Sponsor, disqualification, forfeiture and the selection of an alternate Grand Prize winner may result from any of the following: [a] any potential Finalist’s/Grand Prize winner’s failure to respond within the time periods set forth above or failure to provide any other requested information in the time period specified; [b] the return of an e-mail notification sent by Sponsor/Administrator as undeliverable after three (3) attempts; [c] potential Finalist/Grand Prize Winner’s failure to provide Administrator with satisfactory proof of age, identity and residency; and [d] potential Grand Prize winner’s failure to execute and return an Affidavit of Eligibility/Liability/Publicity Release (including, without limitation, the Social Security Number as required by law) within 48 hours from the date the form is sent to the potential Grand Prize winner. Federal, state, and local taxes and all other expenses not specified herein are each winner’s sole responsibility. In the event that a potential Finalist/Grand Prize winner is disqualified for any reason, or does not accept a prize, Sponsor, in its sole and absolute discretion, may randomly select another winner or forfeit the prize. 10. Winner Notification and Acceptance. Winner will be notified on or about May 10, 2019 of prize drawing via the e-mail address provided on winner’s entry form. Winner must respond to such e-mail notification within 48 hours after notification. Failure to respond within such time period or return of email prize notification as undeliverable may result in disqualification and an alternate winner may be selected from among all remaining eligible entries. To claim the Grand Prize, winner must complete an affidavit of eligibility/liability and publicity release. A valid photo identification and completed W-9 form will be required. Winners may waive his/her right to receive prizes or grand prize. All prizes are non-assignable and nontransferable. Prizes are not redeemable for cash. No substitutions allowed by winners. Prizes, grand prize and individual components of prize packages are subject to availability and Sponsor reserves the right to substitute prizes or grand prize of equal or greater value. Winners are solely responsible for reporting and payment of any taxes on prizes. Failure to sign the affidavit or release, or to comply with any term or condition of these Official Rules, may result in a winner’s disqualification, the forfeiture of his or her interest in the prize or grand prize, and the award of the prize to a substitute winner. 11. Sponsor. The Anaheim Star Wars Quest, The Best Giveaway In The Galaxy Giveaway is sponsored by Anaheim Majestic Garden Hotel. The decisions of Sponsor regarding the selection of winners and all other aspects of the Promotion shall be final and binding in all respects. Sponsor will not be responsible for typographical, printing or other inadvertent errors in these Official Rules or in other materials relating to the Promotion. 12. Publicity. Except where prohibited, participation in the Promotion constitutes winner’s consent to Main Sponsor’s and its agents’ use of winner’s name, likeness, photograph, voice, opinions and/or hometown and state for promotional purposes in any media, worldwide, without further payment or consideration. * Does not include taxes or gratuities. Blackout dates apply.​ ** Dream Machine Shuttle included with daily room reservations.